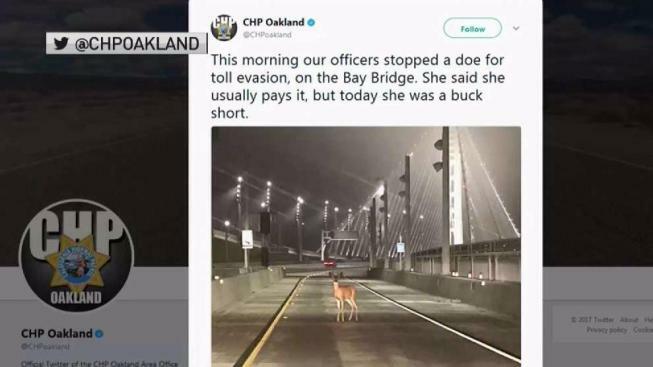 A deer was spotted on the Bay Bridge early Tuesday, and CHP Oakland's Twitter account couldn't help but be a bit punny. "This morning our officers stopped a doe for toll evasion, on the Bay Bridge," a tweet from the law enforcement agency's Twitter account read. "She said she usually pays it, but today she was a buck short." A number of people responded to the tweet with praise. Others were much more inclined to point out that the doe appeared to actually have antlers. Tuesday's sighting wasn't the first time deer have decided to hop on a popular Bay Area bridge. Back in 2014, a pair of deer were seen scampering around on the Golden Gate Bridge.